If you have a pattern of shifts that you need people to fill, you can create a Gaps Template. In order to to do so, navigate to the Gaps Template section in the left sidebar. To add a new template, press Add Template. You can either create a day template or a week template, depending on your needs. A day template will apply to one day only, while a week template will apply to a whole week. If you decide to create a day template, you will need to fill one cell only, reflecting one day of the week. Below, I will show you how to create a week template. First, enter a name for your template, and select the locations it applies to. You will only be able to apply this template to the locations you select here. Press the + icon on the day of the week you want to start with. A window will open to let you enter a new shift. 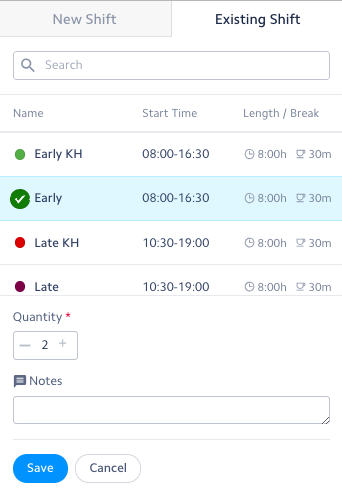 You can create a new shift from scratch, as you would do in the Scheduler. You can include skills needed for the shift, position and also the quantity of this specific shift. You can also add a note that will be visible to the employee. 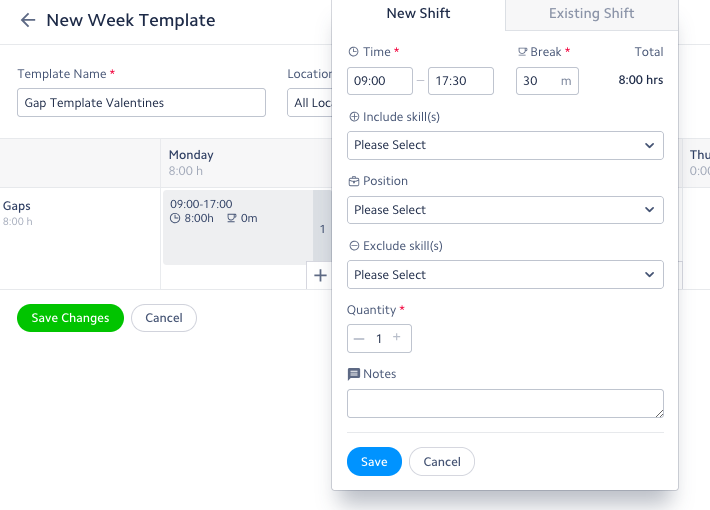 You can also input a pre-existing shift by choosing Existing Shift at the top of the page, these are the same as you have set up on your Scheduler. You can add as many gaps in one day as you wish. Repeat the process until your gaps template is completed, then press Save Changes. 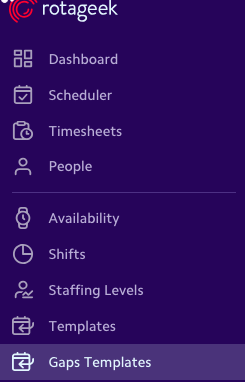 Navigate to the scheduler and press Tools > Apply Gaps Template. 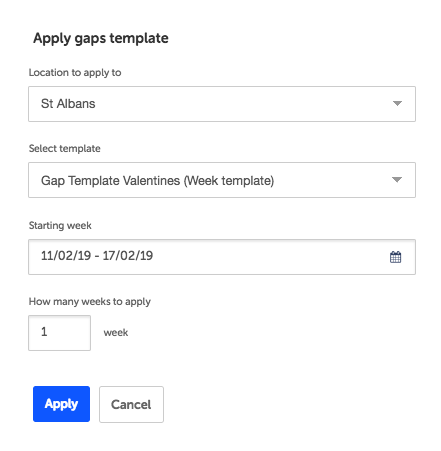 Choose your template, the location and the week you'd like to apply it to, along with the number of weeks it needs to be applied to. Then, simply press Apply. You can then assign these gaps manually by clicking on each of them, or automatically by pressing Tools > Autoscheduler. If you'd like to edit this template, navigate to the Gaps Template section and click on the template you'd like to edit. If you wish to delete a template, you will need to select the template by ticking the box on its left hand side and then press Delete Template(s).